participated in a specific survey. Tags are stored in profiles which are created for every visitor of your website. How to tag respondents upon specific answers? 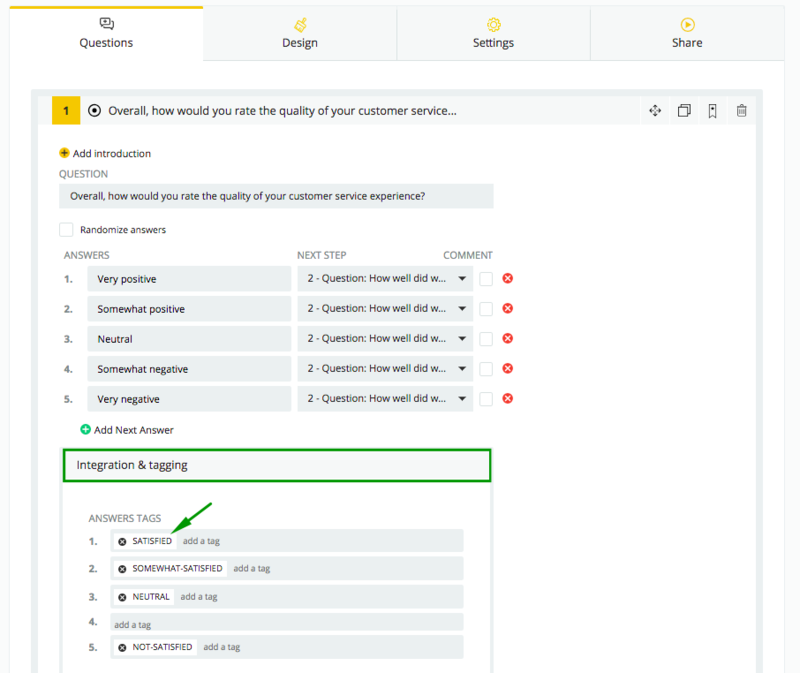 Go to the question you want to add tags to and click on Integrations & tagging then write tags in empty spaces corresponding with answers Enter to create a tag. Each answer can be tagged with multiple tags. If you want to target people who finished your survey, you should tag all answers in the last question with the same tag. How to set up targeting based on tagging? You need to create a new audience segment. To do that, go to the Settings > Who should see the survey? then Create new segment > Have they been engaged with other surveys already? There you can include or exclude people with specific tags. ❗️Remember! You have to enable the segment in order to display the survey properly! Also disable all segments which exclude each other.